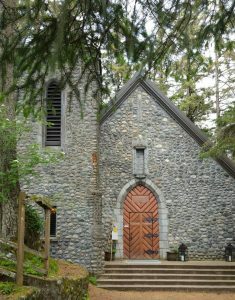 The National Shrine of St. Thérèse is a Catholic Shrine located near the Glacier Park. 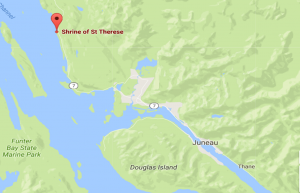 The Shrine is named for St. Therese of Lisieux, the patron saint of Alaska, missionaries, and the Diocese of Juneau, according to the Shrine’s website. She wrote in her au tobiography, The Story of a Soul, that what really matters in life is not our great deeds but our great love. For more information about St. Thérèse of Lisieux, go here. Entry to the grounds is free of cost and the trails are wheel chair accessible. The Shrine naturally has a chapel and, in keeping with Catholic tradition, a garden depicting the Stations of the Cross. This garden features winding trails through towering firs around boulders laced with tree roots. But most notably, it offers a majestic view of Pearl Harbor and Lynn Canal. There is also the Good Shephard Rosary Trail with a Pieta at the end of the trail. Whether or not you are catholic or find significance in the symbology, it is well worth visiting for the views and the beautiful energy of the place. My personal favorite, however, is the Merciful Love Labyrinth. It is an outdoor stone labyrinth in the pattern of the rose labyrinth at the cathedral in Chartres, France. Incidentally, the rose happens to be a symbol of St. Thérèse. It is a meditative labyrinth symbolizing life’s journey to the sacred center in a beautiful mountain garden setting dotted with flowers. 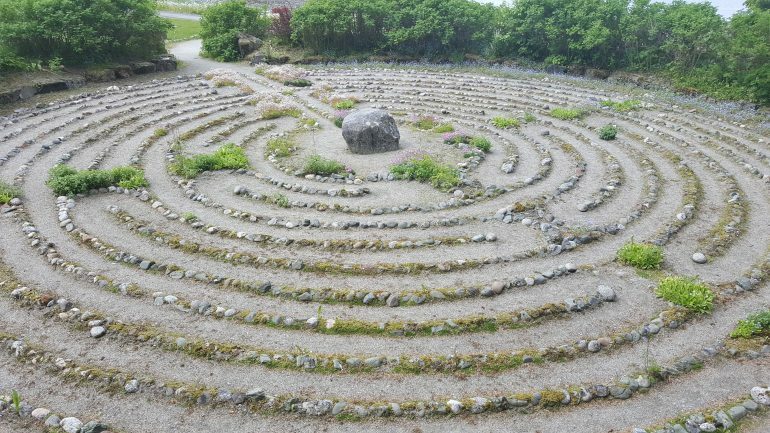 For more information on meditative labyrinths, go here. Whatever one’s religious persuasion may be, this lovely place is ideal for reflecting on St. Thérèse’s message of love, or just simply lifting one’s spirits.